The classic alpine routes of the North Cascades offer tremendous variety and contrast. Some consist wholly of ridge and face climbing on rock, while other ascents are entirely on snow and ice. However, few of the great rock walls can be climbed without first crossing a glacier, and few ice ascents in the region are made without at least a little time on rock ridges or spurs. It is this ever-varied mixture that creates classic alpine climbing in its finest sense. It is also this quality that makes the North Cascades of Washington one of the premier climbing ranges of the world and America's principal training ground for alpinists preparing for ascents in Alaska, the Andes, and the Himalaya. The Institute operates in 6 states and 12 countries, but it is based in the North Cascades because it is the most classically alpine area in the United States. The glaciation is extensive on Mt. Baker - for example the Coleman Glacier flows down as low as 3800 feet where it is still several hundred feet thick - and the juxtaposition of rock faces and ridges with gentle glaciers and steep icefalls is spectacular. These ascents and the other hundreds of routes which we climb can provide a lifetime of rewarding challenge and exploration. Climbing with a guide is one of the most enjoyable ways to experience these exciting wilderness ascents. Part of the attraction of these climbs is the variety and challenges they present on the way to the top; climbers must apply varied technical skills, excellent route finding, and good judgement. The technical resources and margin of safety provided by AAI's professional guides make these ascents very enjoyable and give you the opportunity to further develop your technical, hazard assessment, and route finding skills. You may wish to consider preceding your guided ascents with two or more days of skills review. Every year many of the Institute's clients return to the snow and rock of the North Cascades, the readily accessible glaciers of Mount Baker, or the rock cragging routes in Leavenworth and Index, to "tune up" their skills before tackling their high mountain goals. Any four to six-day (or longer) itinerary can easily incorporate such a skills refresher. Please call or e-mail us to set up a climb or design an itinerary. It's also easy to arrange a trip for a group of friends. Such a trip can be a series of climbs, a skills course concluding with an ascent, or a trip that combines skills development or review with exciting series of ascents. And if you are coming on your own but would like to climb with others, you can request that we match you with other climbers of similar background and interest. We hope you will join us this season and for many years to come. The climbs at this level are not technical, and they only require previous backpacking experience when climbing with a guide. These routes offer beginners the opportunity to climb rock, cross glaciers, and experience the enchantment of the North Cascades from a beautiful summit. A few miles southeast of Mt. Baker and only 21 miles from Pacific tidal waters, the easily accessible, sharp peaks of the Twin Sisters Range offer superb alpine rock climbing. This unusual uplift has produced striking aretes and steep faces of highly weathered, sound rock, and its rough surfaces provide some of the best climbing in the Northwest. We particularly recommend the West Ridge on 6570-foot North Twin, where beginning climbers can practice their technique while ascending an imposing, photogenic, and classically alpine peak. Great views of Mt. Baker and the San Juan Islands. Ruth is a gentle mountain amidst some of the most rugged country in America. Our approach takes us into classic Northwest terrain, first through forests of giant fir and spruce, then steadily higher to the alpine slopes of Hannegan Pass. From there we traverse around beautiful alpine knolls to reach Ruth's summit glacier. We rope up and make the easy climb to the summit for spectacular views of the seldom seen northeast face of Mount Shuksan, Nooksack Tower and the jagged peaks of the Picket Range. This is a remarkably scenic climb from start to finish. Glacier Peak is unique among other Cascade volcanoes in that it is in a true wilderness setting with no roads or visitor centers on its flanks. The long approach (approximately 10 miles) keeps crowds at bay so chances are strong that you will have the peak to yourself or at most a few other parties. The Sitkum Glacier route is a non-technical climb to the summit that rises above miles of wilderness areas, offering spectacular views of the Cascades due to its central location in the range. Sahale Peak, in the very heart of the North Cascades, offers beginning mountaineers opportunities for easy glacier travel and rock climbing in an unsurpassed alpine setting. We begin our approach beneath the imposing 5000-foot North Face of Johannesburg Mtn., hike up one of the most beautiful trails in the National Park to famous Cascade Pass, then climb north up Sahale Arm and make camp high on the peak above alpine meadows. The next day we cross Sahale Glacier and make an easy rock climb to the summit from which we can see some of the best views in the range. The ascents at this level are not highly technical, but the snow and ice routes cross major glaciers, while the rock ascents involve multiple pitches. Participants should have some backcountry experience as well as basic glacier travel, ice axe, and cramponing skills for the snow and ice routes and basic rock experience for the rock ascents. Use the curriculum of AAI's 6-day Alpinism 1 Course as a guideline. Mt. Baker is the northern crown of the Cascade Range. At 10,778 feet it rises abruptly above the island dotted Pacific waters of Washington and British Columbia. Our high camp on the Coleman Glacier is one of the most beautiful in North America affording views of the North Cascades, the Canadian Coast Range, and the Gulf Islands. On summit morning our route takes us close to the big rock walls and hanging glaciers of Colfax and Lincoln Peaks, and ascends Baker's summit cone by its west side. From the top we can look down into the volcano's steaming, ice-choked crater, and enjoy even more sweeping views which include the Olympics and Cascade volcanoes to the south. A climb from the Quien Sabe side of Sahale Peak features the spectacular scenery of Boston Basin including views of Boston Peak, Sharkfin Tower and the intimidating north face of Johannesberg Mtn. The moderate route traverses across the Quien Sabe Glacier, climbing steeply to the Boston-Sahale Col before ascending a mixed snow and rock ridge to the summit. Once on top most people are left breathless, partly from the climb itself but mostly from incredible views of the surrounding wilderness! One of the world's most beautiful peaks, Mt. Shuksan presents all the spectacular features that an alpine environment can offer - steep walls, hanging glaciers, heathered arms, and alpine tarns. The Sulphide Glacier offers an ascent within the grasp of most climbers, but this is no "tourist route." Different climbing problems must be overcome at different periods in the season, and there is always a variety of challenge on both rock and ice. Our approach takes us to a scenic camp at the foot of the glacier. Early on summit day we climb some steep snow pitches, where we may also be presented with moderate-level water ice; we then cross the low angle glacier and conclude with a class 5.0 climb up the rock pyramid. From the summit we are rewarded with some of the best views in the Cascades. Skiers of intermediate ability can also consider this an excellent opportunity to make a ski ascent combined with the summit rock climb (May to mid-July). Eldorado Peak stands high above one of the most glaciated areas in the Cascades. Few mountains offer so much exhilaration and exposure with so few technical difficulties, though it is guarded by a steep, strenuous approach. Once we gain the upper plateau, camp is set on a scenic ridge that divides the Eldorado and Inspiration glaciers. Early on summit day, we start up the gentle slopes on Eldorado glacier where our first views of the mountain appear. Easy climbing gives way to gradually steepening snow and ice until we reach the final snow arete, and the real reason to climb Eldorado. Dubbed by many climbers as the Cascade's Himalayan counterpart, the knife-edge ridge of snow leading to the summit is one of the most spectacular endings to any climb of this level. Unparalleled three hundred sixty degree views and true alpine exposure in the heart of the Cascades is what makes Eldorado such a classic climb. The South Arete of the South Early Winter Spire offers superb climbing and splendid views of the surrounding Cascades. AAI Collection. Often photographed, the Early Winter Spires and Liberty Bell stand out among the granite towers which cluster south of Washington pass. Although less well-known than routes on its famous neighbor to the north, this arete offers a satisfying ascent for less experienced climbers. Our approach takes us through a beautiful larch forest to the southernmost and highest rampart of the Liberty Bell massif. After a challenging 5.5 move early in the ascent, we enjoy stimulating, but moderate class 5 climbing with firm holds and increasing exposure on the way to the summit, where - from 7807 feet - we can trace the course of the Early Winters Creek some 2000 feet below and admire walls of Cascade peaks rising from the valley. Considered a fine introduction to the Liberty Bell towers, climbers frequently follow the South Arete with an ascent of the Beckey Route on Liberty Bell. Long famous among the Northwest rock enthusiasts, the 7720-foot granite spire called Liberty Bell puts a variety of routes at our disposal. This route, up the Southwest Face, is a more sustained climb than the ascent on South Early Winter, but rock climbers who have had some experience (or who have just done the South Arete) will find it very rewarding. The slabs, cracks, and chimney on the route warrant a variety of techniques with moves up to 5.6, and every pitch is different. The summit affords broad views of this very photogenic alpine region. These ascents call for more technical skill than the moderate level climbs. Fisher Chimneys and Frostbite Ridge challenge climbers who are still developing their technical skills, but who are thoroughly versed in the fundamentals of alpine technique. The rock routes on Forbidden and Triumph are more sustained, physically demanding, and exposed than either of the first two ascents listed here. All are exhilarating ascents of North American classics. For all these routes, you need to be able to perform well in a team, handle a rope with skill, and employ varied climbing techniques. Unique in many ways, Shuksan is one of the highest non-volcanic peaks in the Cascades, and it is among the most sought-after summits in North America. Like the Sulphide Glacier, Fisher Chimneys is a mixed route - climbers encounter snow, ice, and rock - but this is a longer, more advanced climb, and you should be comfortable on 4th class terrain. Our ascent follows a scenic glacier-carved valley to a little lake overlooking a spectacular basin. The climb first involves easy rock climbing in a series of chimneys, then moderate glacier climbing over parts of three different glaciers, and concludes with a 5.0 ascent of the summit pyramid. Several AAI guides consider this to be among the best climbs in America. Our approach takes us through classic alpine country where mountain goats can sometimes be seen, to high camp near the Vista Glacier - well named for sunrise and sunset views. On summit day we encounter increasingly steep terrain, with one short and enjoyable, 65-degree snow step which we belay near the rock formation known as the Rabbit Ears. From the crater rim, we climb over moderately steep terrain to the summit where we are rewarded with a spectacular view of peaks from Rainier to Baker. Forbidden lies in the heart of the most glaciated area of the North Cascades and one of the most scenic regions of North America. Our ascent begins with a climb into Boston Basin directly across from the 5000' North Face of Johannesburg Mtn. Our route crosses a small glacier and then goes up a 500-foot ice filled couloir to gain the West Ridge. Then we follow the ridge crest on 4th and moderate 5th class rock to the summit with some exposure and spectacular views the whole way. This is a challenging rock climb in a rugged alpine setting. The rock is of high quality and the climbing on the exposed crest very enjoyable, making it easy to understand why the West Ridge is listed in the Fifty Classic Climbs of North America. The aptly named Mount Triumph is one of the true crown jewels of the North Cascades, equally spectacular in shape and position. Rising like a rock dagger, it stands alone across Goodell Creek from the Picket Range, the most rugged and remote mountain range in the continental U.S. Our approach takes us first to a base at beautiful Thornton Lakes and then up gradually steepening ground to a high col. We cross a large, unnamed glacier to gain the base of the ridge which we ascend in a series of 5.0 to 5.6 pitches directly to the sculpted summit. Climb Triumph for a variety of classic alpine terrain and breathtaking views into the heart of the North Cascades. We climb a striking line to the top of this remote 9,200-foot mountain. Though the climbing is mostly moderate, this is is a committing route, long and with 6,000 feet of relief from trailhead to summit. Located in North Cascades National Park, Mt. Goode is situated in the vicinity of many spectacular, high peaks, including Mt. Logan, Mt. Buckner, Dome Peak, and Bonanza Peak, and the views from the top are breathtaking. Enjoy mostly crack climbing on super high-quality rock. Enjoy spectacular views and high-quality climbing while on the route of this 8,400-foot peak. One of the Wine Spires (which also include Chianti, Pernod, and Chablis Spires), this climb is both sustained and challenging and finishes with a series of chimney and off-width cracks. These climbs require a complete repertoire of snow and ice or rock climbing skills and the ability to perform them consistently without error, as well as excellent physical condition. Climbers who have performed well in AAI's Alpine Ice Climbing course or others who have similar experience and who have all the skills listed in the curriculum for that course should be qualified for these ascents. Technical requirements for rock climbs are listed individually. We climb the northern flank of the Coleman Glacier and cross the main portion of the glacier just below the 8000' level, passing immediately below Baker's Coleman Headwall. The approach usually offers moderate climbing but complex route finding challenges as we negotiate around some huge (and many small) crevasses. The North Ridge itself presents 2700' of mixed snow and ice, including a section of steep ice about two thirds of the way up the route. Complex route finding low down and varied technical challenges on the ridge make this a very rewarding climb. Dominating the eastern rampart of the Stuart Range, 8840' Dragontail has become popular with climbers due to its sound rock and magnificent appearance. The Northwest Face in particular has been termed "one of the finest walls in the West." Serpentine Arete juts out of this face, a few hundred feet above Colchuck Glacier. Class 3 and 4 climbing takes us up to a pillar, and from there the route becomes more demanding and quite varied, with face climbing, liebacks, jamming, and finger cracks 5.7 to 5.8. The climb then eases off again for the final few pitches to the summit. These two climbs are among North America's finest alpine routes; both offer combinations of challenging rock and ice climbing. We approach both via Sharkfin Col, from which we rappel onto the Boston Glacier. Interesting route finding across this big glacier takes us to the lower North Ridge which we cross to reach the Forbidden Glacier. For the ascent of the NW Face of the North Ridge, we move to a point below the ridge, where we climb 1000 feet of 45-degree snow and ice. We then climb the ridge crest to the summit, enjoying moves up to 5.5. To reach the Northwest Face, we climb further up the Forbidden Glacier to gain the central spur of the NW Face. This impressive ridge runs 1700 feet directly to the summit with moves to 5.7. Both routes offer a classic combination of technical and mountaineering challenges in one of the continent's most rugged and remote alpine settings. Like Forbidden, Stuart's North Ridge is a classic alpine rock climb, but unlike Forbidden, it lies east of the Cascade crest, in a more arid climate. Our route on this "monarch" of the Wenatchee Mountains takes us across a glacier and onto the ridge which rises almost 3000 feet above Mountaineer Creek. Here excellent granite provides secure holds, and we employ a variety of techniques among slabs, chimneys, couloirs, and gendarmes as we negotiate our way up. The upper route offers the choice of either 5.7 or 5.9 variations. Stuart's North Ridge is a long climb with steadily increasing exposure. The rewards of its technical challenges are matched by its summit's panoramic view of lakes, parklands, and peaks. Climbers can follow Forbidden with Stuart to make a spectacular week of alpine climbing. These routes include some of the most exciting and challenging ascents in North American mountaineering. Climbers must be in excellent physical condition, possess advanced skills, and have significant previous alpine experience. This Headwall is the biggest ice face in the North Cascades. The Coleman Glacier travels from Baker's 10,778' summit down to an elevation of 3800 feet. Its headwall is 2500 vertical feet running at an average of 45 degrees and offers a challenging combination of snow and ice. At some times there are short 60 to 70-degree steps at the base of the wall and two-thirds of the way up, and the bergschrund may include up to 20 feet of vertical water ice. This is a very large scale and rewardingly varied alpine route. East of the Serpentine Arete, this route takes us up the other prominent ridge on the Northwest Face. However, Backbone Ridge is a more demanding climb - we encounter a 90-foot, 6 inch crack which offers class 5.9 moves, as well as some class 5.9 face climbing. While effort is not sustained at 5.9 (there is also some class 4) it is a long ascent of some 21 pitches, and climbers should be ready to bivouac on the summit. 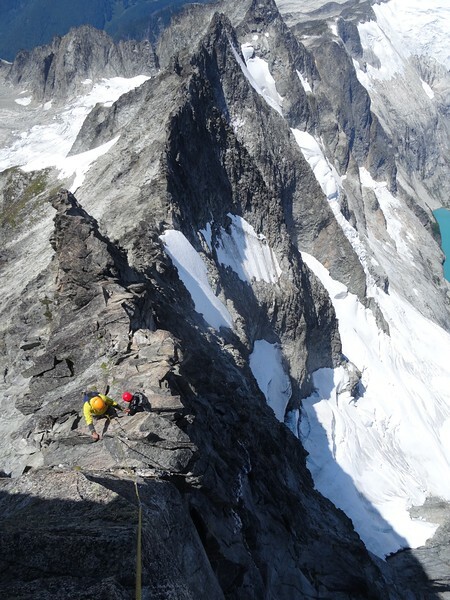 Many climbers combine a route on Stuart with an ascent of Backbone Ridge for a satisfying week of advanced alpine rock climbing on the sound granite of the Stuart Range. This complete route on the North Ridge is more difficult than the climb in Level 4. Instead of traversing the Stuart Glacier, we approach directly to the base of the ridge and choose one of two variations to start up the rock. In either case climbers enjoy moves at class 5.7 or 5.8 before reaching the intersection with the standard North Ridge route. This ascent includes a bivouac on the ridge. The direct route is a sustained and rewarding ascent above the inspiring northern and eastern faces of this great mountain. The 1200-foot East Face of Liberty Bell is one of the finest big walls in the Pacific Northwest, and Liberty Crack is considered one of North America's classic routes. Climbing is very strenuous with moves up to 5.10. Two full days or more are required to complete the face (with the possibility of one hanging bivouac). The first several pitches are aid and the remaining ten are free climbing. Climbers should be able to lead 5.8 and have experience jumaring and cleaning aid. This is an exhilarating climb on a beautiful granite wall. This is America's most varied and scenic alpine traverse. It is a combination of backpacking, rock scrambling, and glacier climbing through the heart of the North Cascades, from Cascade Pass to a valley just north of Glacier Peak. We cross a series of ridges, cirques, and glaciers as we make our way to each new camp. Our views of game, alpine lakes, distant peaks, and close-by rock walls and icefalls are impressive. As time and ambition allow, we ascend peaks along the way: Magic, Spider, Formidable, Le Conte, Old Guard, and Spire. The Ptarmigan Traverse is a classic alpine journey that crosses some of the most wild and remote terrain in the North Cascades. The Pyramid - Inspiration Traverse is another of the most beautiful, scenic, and challenging high alpine traverses. Though not particularly remote, this rugged wilderness is seldom visited, and several peaks along the way have seen fewer than a dozen ascents. Completion of the traverse requires a wide range of climbing and wilderness skills. Along the way there are opportunities for ascents of glaciated peaks and rock towers, including Pyramid, Pinnacle, The Needle, McAllister Pinnacles, Klawati, Dorado Needle, and Eldorado. Of the Pacific Northwest volcanoes that stretch from British Columbia to Northern California, Washington contains 5 of the highest and most heavily glaciated. These high peaks offer challenges for climbers at every skill level from gentle ridges and broad glacier traverses, to moderate ridges and classic glacier ascents, to steep aretes and committing headwalls. Climbers often arrange a week of ascents around such groups as: Adams, St. Helens, and Rainier in the Southern half of the state; and Glacier Peak and Mount Baker in the Northern half. Call us to discuss the possibilities for a skills review followed by one or a series of climbs. *Two exceptions to our private pricing include a private 3-day skills and ascent of Mt. Baker and a 3 or 4 days skills and ascent of Mt. Shuksan. Once these private trips exceed 2 people the price defaults to the public rate per person as posted on the Mt. Baker Skills and Climb and Shuksan Skills and Climb program pages. Inclusions: group climbing equipment, including rope and protection. Exclusions: transportation from meeting place to climbing locations; personal climbing and camping gear (rentals available); etc. etc. "From route suggestion to climbing style and attitude, this was one of the best trips I've done. My guide met and exceeded my expectations- I would climb with him again in a second." "Not only was my guide excellent in all respects, he is a patient and thorough teacher as well. I was impressed with the attention to safety and back-up systems that my guide and staff showed. I look forward to climbing with AAI again soon." "What impressed me the most was my guide's commitment to safety...he was satisfied not only that we'd merely learned the necessary skills but that we had mastered them as well. I felt this demonstrated his commitment to the sport and his professionalism. "